This summer just got a whole lot more interesting, as Pop the Bubble unveiled its first capsule collection named after what we all secretly would like to be: NOMADE, a poetic, French-y twist on the nomad life and style. There's something wearing playful quotes on our t-shirts that makes us happy and carefree. We're saying something, that's for sure, usually what goes on inside our restless minds. It essentially says we should not take ourselves seriously and should simply allow our inner thoughts to expand onto the outside. With NOMADE, Pop the Bubble wants to convey that kind of laidback summer feeling we are all craving for, as well as the urge to get everything done every day on our busy, busy lives. 'Chasing summer freckles' and 'Driven by coffee', the stars of the show, are available in white and black with hard-wash finish, two colours that go perfectly with... Well, everything. 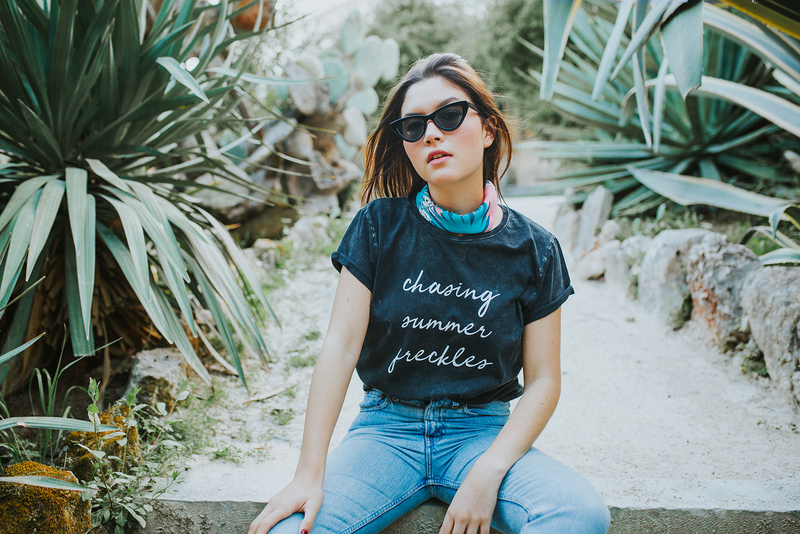 No matter where you are or where you go, these 100% organic cotton tees will be your go-to summer attire. 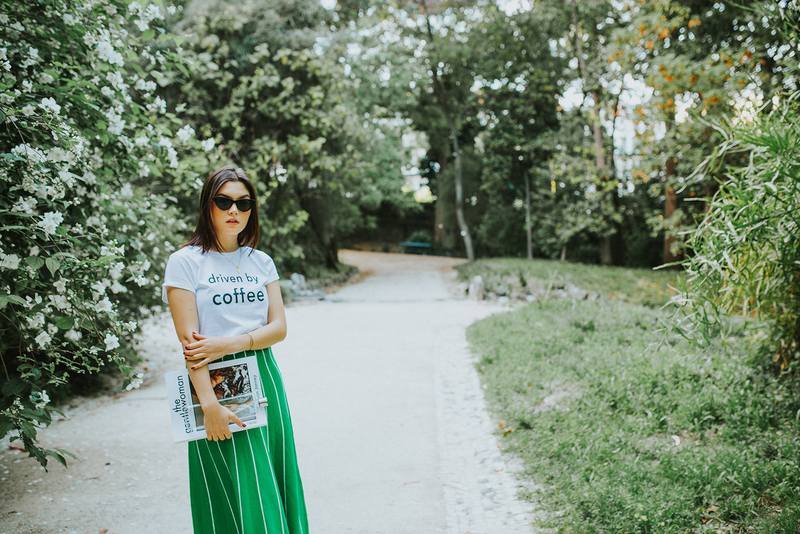 Speaking of organic cotton, let us not forget about the pretty big deal that is the fact that these tees were manufactured in Portugal within the Fair Wear Foundation, which is a non-profit organisation that works with brands, factories, trade unions, NGOs and sometimes governments to verify and improve workplace conditions for garment workers in 11 production countries in Asia, Europe and Africa. You should read more about it right here. Designed for cool women who live intensely the busy days and the relaxing moments at the beach, who enjoy the sun and the salt water. As if a t-shirt line weren't enough, Pop the Bubble introduces two scarves - 'Bali' and 'Los Angeles' - with unbelievably summertime-inspired patterns and colour palettes made within an exclusive collaboration with Portuguese design studio, INEDIT. 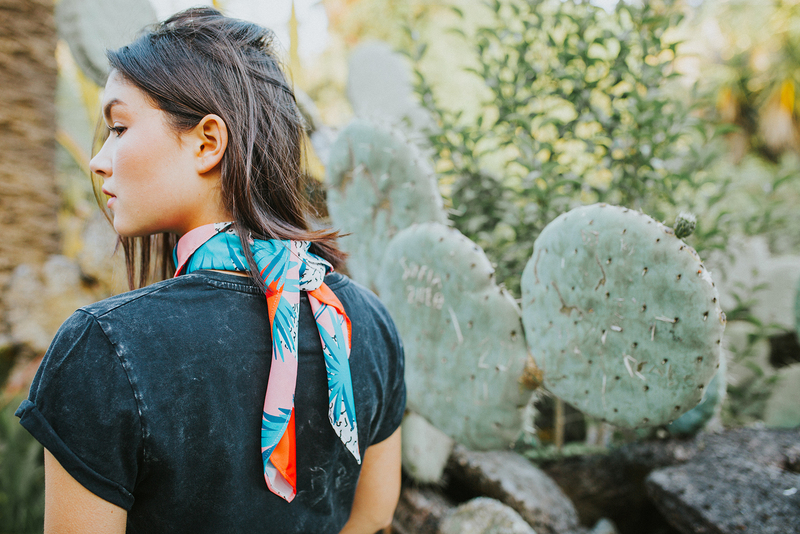 Fresh, light, and breezy, these scarves are the perfect add-on to your outfit, whether you're at a lively cocktail party or enjoying a warm, summer night in an al fresco terrace. But wait, there's more: to keep all of your things together in just one place, there is still one more accessory to show you — though to really see it and touch it, as well as the rest of the capsule collection, you need to go to Summer Market Stylista this weekend (May 26 and 27) at FIARTIL, in Estoril. Pop the Bubble will be there to show you 'Clear', the new minimal, see-through bag inspired by the latest street style ventures you've seen throughout this past fashion month — with a twist, of course! You'll be the one choosing if you want everyone to see what's inside your bag or if you rather add a clutch or smaller pouch to keep your belongings safe and sound. NOMADE is here and it's already making us dream of relaxing summer evenings, unwinding by the ocean or somewhere in the city, flaunting Pop the Bubble's first capsule collection with a smile on our faces.